They are called gunwales, outwales, or simply wales. They are thin strips of hardwood that run the length of the hull along the sheer line. They are quite necessary for a guideboat. Wales reinforces a hull that appears deceptively fragile. There was an old time guideboat builder in the northern adirondacks whose last name was Martin. His boats were so lightweight and had such a delicate appearance that they became known as “Martin’s eggshells”. Fortunately, the hull of a guideboat is much sturdier than it appears. The wales also provide a place to attach the straps, or oar sockets, and the decks, which hide the carrying handles. My past experience with hanging wales causes me heartburn. The wales on my boat are one-inch square cherry stock that run the length of the hull. On past boats they were very stiff. To counter that in the past I have had to rig a tent to steam them and use a windlass affair to slowly bend them in place. It took a number of hours to get one side of the hull done. I was always afraid that I would hear a “craack! as I forced the stock to conform and have wasted hours of work. Fortunately that never happened. Someone suggested that, instead of using flat sawn cherry for the wales, using quarter sawn stock is much easier to hang. It made sense to me since the grain will then run parallel to the length of the stock and therefore should be more compliant to bending along the sheer. I took the suggestion and bought 3 1/2 board feet of quarter sawn cherry at $9.80 a board foot. It is not a cheap route to go. I milled the material to one inch square stock and scarfed it to get two pieces 16 feet long. 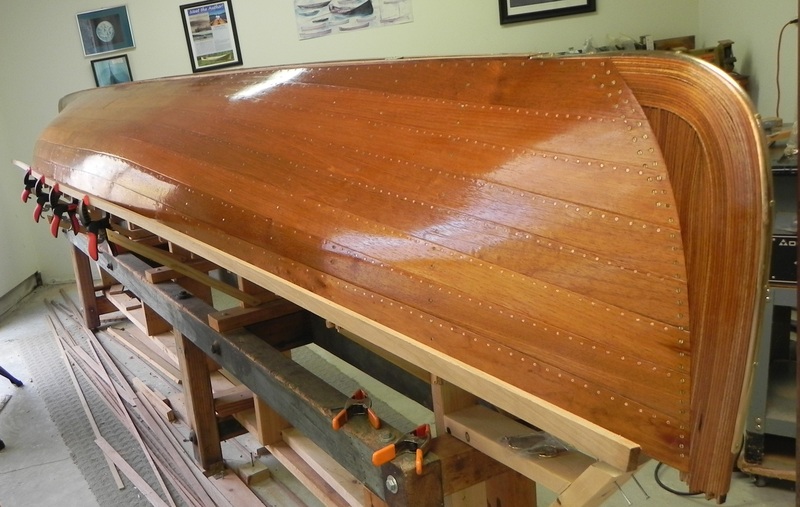 I used #8 X 1 1/4″oval head brass screws to fasten the wale to the hull starting at the midships. The oval head screws lend a decorative look to the finished boat. I left the hull on the builder’s jig while installing the wales so that I wouldn’t have to worry with the hull “flopping” around. The wales went on very easily with only modest pressure necessary to conform them to the hull. When installing the wales, if there is a choice of whether to use the sheer edge of the plank or the wale to define the sheer line, default to the wale. In any case, you should end up with a nice, fair curve to define the sheer line of the hull. I then got ahead of myself and tried to join the end of the wale to the stem. This is not a good idea as I soon learned. This joint is very difficult to get right and probably impossible when the hull is upside down and the joint is below your waist. I will show you some tricks I learned when I joined wale and stem once the hull was right side up. Below is a photo of the hull with a wale being installed. Next post Building an Adirondack Guideboat-off the jig!